We’ve topped the Spiceworks Best Antivirus list for 3 years running and have hundreds of rave reviews. Find out why IT pros are hot for Webroot. See for yourself why Webroot SecureAnywhere® Business Endpoint Protection is #1. 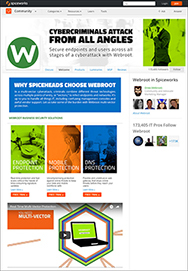 Follow Webroot on Spiceworks to get the latest news on Webroot events, products, and more! Two IT Pros attending Spiceworld share why they prefer using Webroot for endpoint security. * Offered in United States between 10:00 AM MT on August 20, 2018 and 12:00 PM MT on December 31st, 2018 ("Offer Period"). During the Offer Period, you will receive 10% off the MSRP purchase price (excluding applicable taxes) when you purchase a 1 year subscription of Webroot SecureAnywhere® Business Endpoint Protection for up to 249 endpoints. Offer is valid for Spiceworks Community members only. Offer applies only to subscriptions purchased from www.webroot.com or by phone at 1-800-870-8102, and is available only while supplies last. Not valid on previously purchased or out-of-stock merchandise. May not be combined with any other offer, coupon or discount. Webroot reserves the right to modify, cancel or terminate this offer at any time without notice. Void where taxed, restricted or prohibited, and to employees of Webroot and participating online affiliates.